In the frozen wilderness of North-central BC, a small, furry head pops out from under the snow. Its fox-like profile stands out against a creamy orange bib of fur. In a flash, the animal’s long, lithe body and bushy tail spring from the powder. It is an American Marten (Martes americana), a medium-sized mustelid known for its tree-top acrobatics and cat-like curiousity. She boldly lopes across the snow towards a tasty morsel, conspicuously placed to entice her into a cage trap disguised with branches and straw. 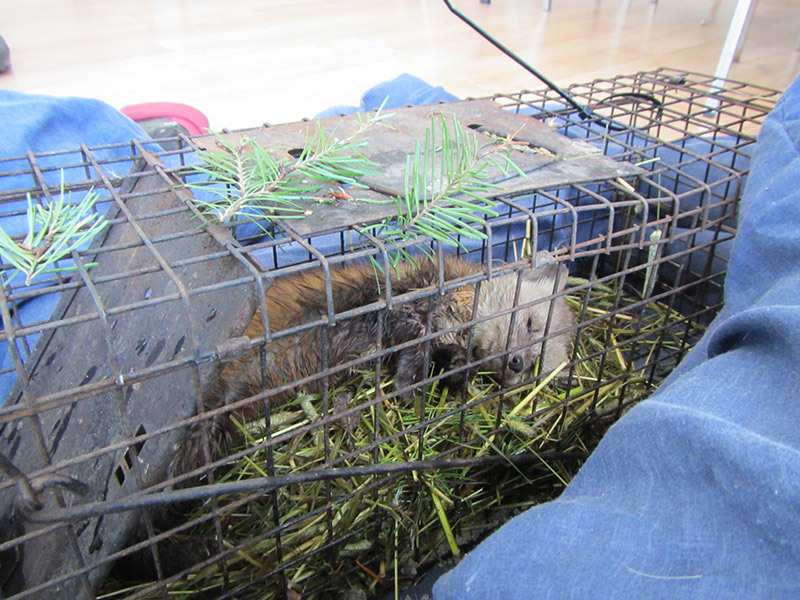 Marten are commonly trapped for their pelts, but this cage won’t spell her demise. Instead, she will become part of a ground-breaking study examining marten’s movements, and how they might be affected by forestry practices. Shannon Crowley, a researcher with the John Prince Research Forest (co-managed by UNBC and T’laz’ten Nation), and his colleagues check the study traps daily: if they’re lucky enough to get a marten, they fit it with the latest in GPS collars before releasing it safely back into the forest. Crowley and his colleagues are working on their second year of an HCTF-funded project to determine how marten populations are affected by salvage logging of Mountain Pine Beetle-ravaged stands. They are comparing the species’ use of logged and unlogged areas by remotely tracking the movements of their collared subjects. The general rule of thumb for tracking collars is that they shouldn’t exceed 5% of an animal’s body weight. The collars used by Crowley and his team are below that threshold, sitting at around 3%. Above: Video showing typical marten behaviour. These curious creatures often travel under the snowpack, but are equally adept at climbing trees. See more videos of marten and other mesocarnivores filmed in the John Prince Research Forest at the end of this post. Crowley says the location data from the new GPS collars is a significant improvement over what they could previously obtain using radio units. Crowley’s team has been working closely with local forest company Conifex to compare martens’ response to different logging practices. Eventually, their results could be used to inform forest management decisions so as to reduce the impact on marten, as well as other species. Though Crowley’s marten study is a short-term project, the data collected will become an important component of a long-term monitoring program focused on mesocarnivores, a group that also includes fishers, river otters, foxes and Canada lynx. This level of understanding is particularly important when considering the rapid rate of environmental change associated with salvage logging. Though marten populations as a whole are thought to be stable in BC, they have become endangered or even extirpated from other jurisdictions through habitat loss. “Research like this is really about taking preventative action, so that marten don’t become endangered in BC as a result of land use practices.” Crowley states.